Sunflower Stamper: CCJC5 Bright Neighbors! The challenge this week over at Create with Connie & Julie is a color challenge. The colors: Old Olive, Melon Mambo, Crushed Curry & Pumpkin Pie. Oddly enough, they are fun colors together! The Welcome Neighbor DSP pack that is FREE during Sale-a-Bration right now has those colors in it so I started there. And I decided if I was going bright, I was going all the way! Card base is Old Olive with a Whisper White layer. Background is several strips of the Welcome Neighbor DSP-one for each color in the challenge. 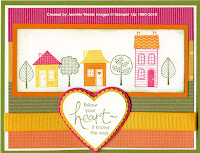 I grabbed the four ink pads and stamped a row of houses and trees using the Good Neighbors SAB set. I actually resorted to using the stamp-a-ma-jig too. Couldn't get the roof on the tall house straight any other way! Next I added a Crushed Curry ribbon and a layered heart using the saying from Whimsical Words, another SAB set. The heart is layered using the Full Heart punch for the saying, the new Embosslit Scalloped Heart of Hearts, and the Punch Window Heart. I like it-colors are always welcome this time of year-it's either bright white outside with snow, or very dreary. For some reason though, I have the words "little pink houses" going through my head! LOL! Hope everyone had a good Thursday. Off to fix dinner and work on some laundry. Very, very cute! I love how bright the little houses are! Thanks for playing along with Create with Connie and Julie this week! You did a great job with those colors! Love the cheery neighborhood you've created! Love your row of houses! I really like how you used the heart for your sentiment. Great Card Jennifer! This is one of the nicest cards I have seen with this stamp set! Thanks for playing along this week and good luck in the challenge! I love the heart with the houses - what a great idea. Thanks for sharing!